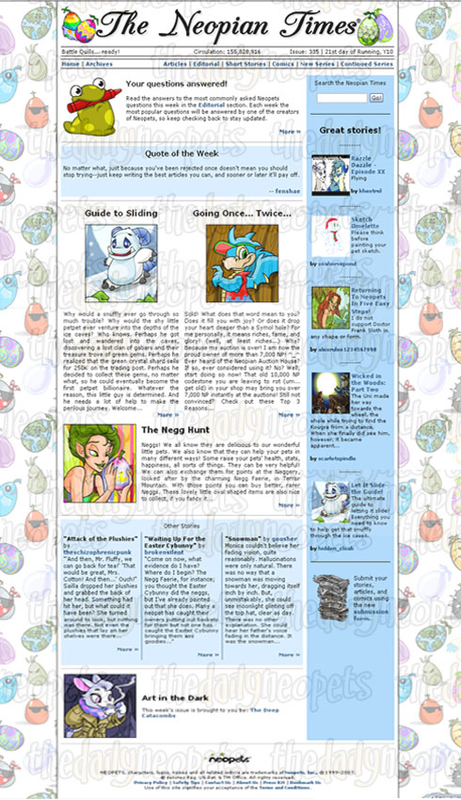 The Neopian Times is an online newspaper made by The Neopets Team (TNT). Most of you are likely already familiar with this, but in case you are not, I am here to give you a little tour around The Neopian Times (NT). By the end of this tour, you should be able to navigate it by yourself and even submit your own work! I will break this image into parts and explain to you what they mean. Here is a list of all of the different components of this page and a description. Banner: The main banner changes on "Special Occasions", such as Holidays. I am going to use the Easter Edition of The Neopian Times as an example. As you can see, the banner has changed and looks EGGcellent. 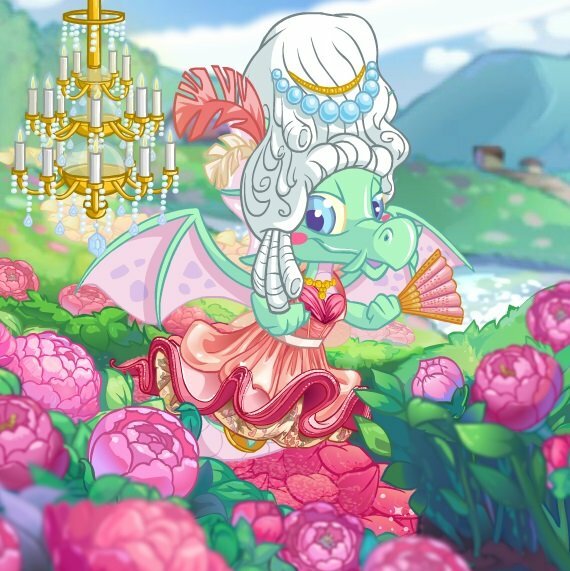 Mind you, for some holidays, The Neopets Team will change the color of the layout, too! A Yurble stole my cinnamon roll! Caution: Quills may be sharp. 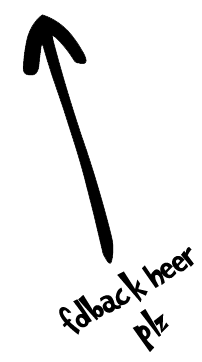 Invisible Paint Brushes rock (Invisible Paint Brushes text is actually invisible). White Weewoos don't exist. *shifty eyes* . There are ants in my Lucky Green Boots (Not sure if this is a reference to Toy Story's Woody's quote, "There is a snake in my boot"). And there are many more! If you want to find more random quotes, simply refresh the page. Circulation: The number of Neopets Users who have read The Neopian Times. Issue: The number of the The Neopian Times edition that you are currently reading. Date: The day, month and year the edition was published. Home: Takes you to the Main Page of The Neopian Times. Archives: Takes you to a list of all the editions that have been published so far. The red asterisk indicates the edition that you are currently reading. Articles: Will take you to a list of all the articles. You can read the description of each one and click on any that you like. Editorial: Takes you to the Editorial page. The Editorial is a selection of questions that TNT have chosen for the week. They receive thousands of them so do not expect your question to be posted in the Editorial on the first try (unless you are extremely lucky). You can also write a note to TNT, along with your question, asking them to remove your username. Short Stories: Will take you to a list of all the short stories. Comics: Will take you to a list of all the comics. New Series: Will take you to a list of all the series. Continued Series: Will take you to a list of all the sequels of a previously submitted series (i.e. part two of "Your Name New Series"). Your Questions Answered: This is just a quick shortcut to go to the Editorial. I recommend you check it out when you read the issue. It contains very useful information! Quote of the Week: The Neopets Team will pick a part of a story or article and simply quote it. It can be as short as a sentence or as long as a paragraph. The name of the author is underneath it and if you click on it, it will take you to the author's article. Previews: Below the Quote of the Week, you will find a preview of articles, stories, etc. Issue Sponsor: At the very bottom of the page, you will find the sponsor of The Neopian Times issue. Great Stories: This is just The Neopets Team's best story picks. Submission Form: A link that will take you to the section forms, where you can submit your own content! There is only one type of trophy that you can get if you get published. If you get published more than once, the text underneath your trophy will change to '2x, 3x, 4x, etc' depending on how many times you have won. You can also get two very nice avatars. The NT Writer avatar (left) can be obtained if you get published in a 50th issue of The Neopian Times (200th, 250th, etc). The NT Star avatar (right) can be obtained on your 10th publication in The Neopian Times. During special events such as Halloween or Christmas, themed issues of the Neopian Times are released. If you are published in one of those editions, you will get a nice reward for your work!